She is Riszen, so that We and You AllAre & May Be Riszen, every Yes, Every She and Every He. Many have feared that Humanity faces the End Times and will become Extinct, destroying the viability of Planet Earth. The New Millenniall Golden Rule. A Woman has Riszen, Rajchelle OneFamily, a Phi Betta Kappa wellcomed Honors, Ph.D. in psychology and intergenerational family and community studies, who ran for CoPresident as a Write In in Maryland in the Millenniall Year 2000, who has indicated her verifiable keystone geneallogy relates her to B’Hai, Buddhism, Christianity, Greco-Roman-Balkan and other ancient Thealogy, Hinduism, Islam, Judaism, Unitarian Universalism & Zorastrianism, and All Good Faith. She is the Reincarnated and verifiable geneallogicall progeny relative of the beloved youngest First Cousina (Cousina, is the term Europeans call female Cousins) of Jesus of Nazareth, niece of Mary/Mariam/MaRaIam of Nazareth and simultaneously a Cousina of Mariam/MaRaIam of Magdala, all who were descendants of MaRaIamof the Exodus,whose family tree intertwined in earlier and later generations with the children of ZippoRah, and all descendants of Rachel, called the Mother or Ma of IsRaEl, intertwined later with the Children of Leah, EstHera as well as the expected to return incarnated Greco-Roman-Balkan AstraReah, the Hindu MaRayammas, All who were Mothers of Daughters as much as Sons, and also continues even more ancient Biblicall (including all cultures’ millennia of Goddess Aspect worshipping) and more recent visionary herandhistoricall figures, who benefitted & protected multitudes. A humble simple Sister yet Coleader of Kindness with You & All, Rajchelle Onefamily has found & revealed the KEYto sustaining a reconnected Common Ground (Water & Air, Earth & Sky) for all of Good Faith, which reunites them in harmony, via the balancing impact of the ReEvolved Eternal Feminine with the ReEvolved Eternall Masculine, of Kinship Kindness and Reconnection. Calling herself and her community, who she allways reminds are her and each other’s cousinas and cousins, that is, daughters of sisters and brothers as well as their sons and therefore, also sisters and brothers over time and expanding radiance, CoSavioRa, because Ra is an ancient name for the Sun and Light, she has imparted the New Millenniall Golden Rule to thousands of people (who may have shared it with millions by now). She has Delivered The New Millenniall Golden Rule virtually and in street sermons in Maryland and the District of Columbia https://5050now.wordpress.com/sermons-on-the-mall-and-maryland/, without any objection or criticism, and with smiles, nods of approval & “thumbs-up“, because its ingredients revive the Common Sense of all Heritages’ Bibles and idealistic and utopian and futuristic philosophies, from the ~More Family’s famous Utopia to Star Trek and Star Gate science fiction, as well as the Enlightenment, which gave rise to the North American Multi-Heritage experiment, for ReAll Democracy as Divine Governance, and Kindness in Life and Liberty for Happiness for all. 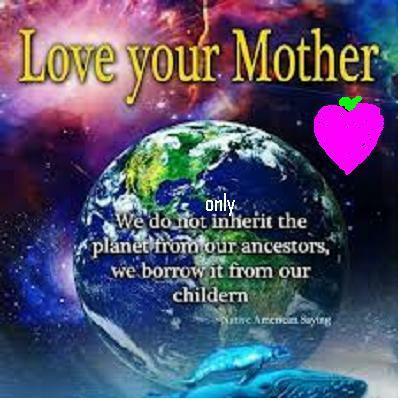 The New Millenniall Golden Rule fulfills All Biblicall prophesies based on her & everyone’s, in fact, both genetic and culturall geni~us intertwined Heritages, reunited with deep systems anthropologicall, sociopsychologicall, culturall, herandhistoricall, eco nomicall, politicall and geneallogicall information and geoastrophysicall space-time awareness, that includes an understanding of partial or karmic reincarnation in the service of the Wholly and Good, in which Nature and Nurture can interact, with Yin and Yang balance within, between and among people, to bring forth a sustainable balanced Enlightened society, or a Living Everyday Heaven or Paradise on a Universzally interconnected Home Planet called Earth, fit to connect with other living Planets, where, in fact, those who have passed from Earth have been reincarnated. By making the New Millenniall Golden Rule,the Rule of Kindness and ReAll Democracy, that every neighborhood and extended family live by, everyone can Inscribe Oneself and One’s Family&Community in the Book of Eternall Universzall Love and Life, without having to die first, quickly eliminate any need for money, and attain a long lived Youthfull adulthood based in Kindness toward the Divine Inner Child and everYoung Adult, or Coszmic Christ within all Children of the Universze (the z is included to symbolize the zillionsz of light yearsz and generationall expanding Circle of planet-connecting Humanity, that the New Millenniall Golden Rule makes possible, and in fact, simple, when you include the entire human alphabet. a betterbet as aRadiant Circle, and do not get stuck in a hierarchy of heeding mostly only Alpha Males and living in a shadow that diminishes most of Humanity’s Divinely Created Light. This email is being sent to many geneallogicall centers and practitioners, who are Librarians of familyandcommunity herandhistory, from neighborhood to larger communities. 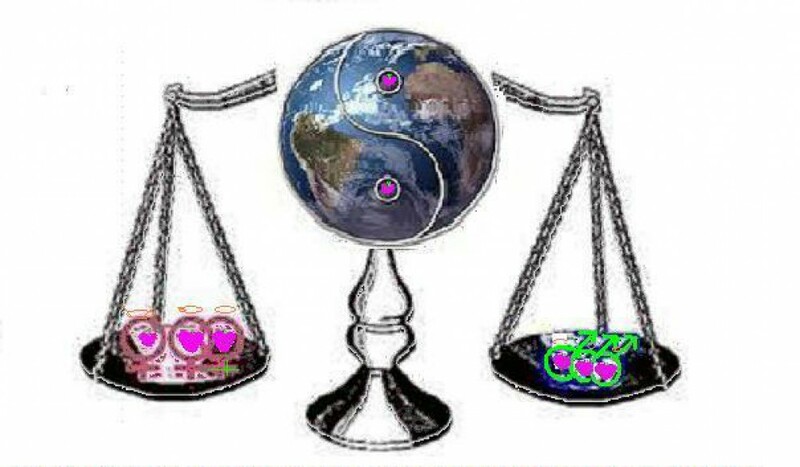 The name Library incorporates the world LibRa, associated with the word Liber for Book but also LibeRate meaning to Free as in Liberty and Liberate, and with LibRa, the astro/astra-logicall sign of the Scales of Balance, ruled by Venus, the bright morning star Planet named for the Goddess of Love. LibRa incorporates the ancient name Ra, embedded in the Hindu word Raj, to Rule, and (Ma) Ra or AstRaReah (pronounced “Raya”), the ancient Goddess as much as God names of many cultures from the Egyptian Raet to the Latvian Ma Ra, to the Japanese AmateRasu, usually associated with Light of Suns or Stars. Rajchelle is a Libran, who ran as a deeply SpirituAll Locall Globall CoPresidentiall candidate in Maryland in the Millenniall Year 2000, as a Write In, with a gentle man women’s and children’s advocate, environmentalist and geology safety engineer, Hjalmer Wayne Erickson, running in Alaska, who also sought to bring at least 50% representation to women everywhere.She wants Everyone to Inscribe All in the Solar and Soular Book of Love and Life as quickly as possible, via their personal and shared, private and public embracing and CoDelivering of the New Millenniall Golden Rule, as CoSavioRa. Our world, especially North America, is currently dangerously and interactively and systemically out of balance on gender and family practices, as well as in its currently titular leadership and paradigms of economics, which are skewing and degrading our stewardship of the environment, such that we are provoking the wrath and withdrawal of support of the MotherFatherGoddessGod, visible in Earthquakes, sinkholes, extreme weather and other disasters, until wechange our ways. Indeed, a consumerist sheered-sheeple-ized humanity, deceived by an older alpha male-controlled media and politicoeconomico anachronistic paradigm of accumulated false wealth that fails to count most labors of love, is so out of balance. 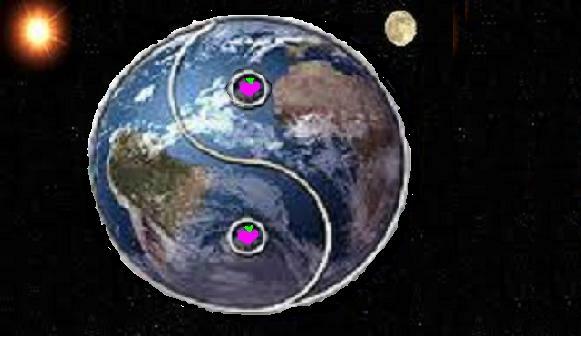 that we are experiencing a Gaia effect in the negative direction. Because Mother Nature can cause major earthquakes (several in North America and as well as South America and worldwide this Spring thus far) which can also trigger Volcanic eruptions, massive avalanches and landslides and tsunamis that can cause Fukashimas, drought and forest fires, ice, snow and windstorms including tornados and hurricanes, and other disasters so quickly when harmony and balance has been disturbed, we must act quickly to regain the balance. which you can print and share (or simply write the important transforming phrases on any conventional money , which is perfectly legal even under current “law”), and will allow humanity to transition from Gross Domestic Product’s “labors of love invisibilizing false values hierarchy on steroids” to new eco~nomics, based on the Genuine Progress Indicator, to transcend from the actually anachronistic use of any Money, as presaged in Star Trek and other utopian visions and science fiction). In fact, this would even benefit CEOs and false wealth Billionaires and their familyes, by Sustaining a Heallthier Planet with a much longer youthfull life span for all, including them, too. Start by Gathering as a Circle with all your known and/or Internet-findable SheKin, at least 3 generations, of known Geneallogically or etymologically connected names (can be anyone you share a surname or even first name, which all have sacred meaning, with) of Women and then Youth, Female and Male, under 37, and Children, girls and boys, and then adult and older men (unless they are the too rare men who have allready worked publically to assist women, and bring about reparative and full gender balance; they are ever young, too), and adding a few more distantly related such as neighbors, classmates and colleagues, especially of various Heritages and locations on this Planet. 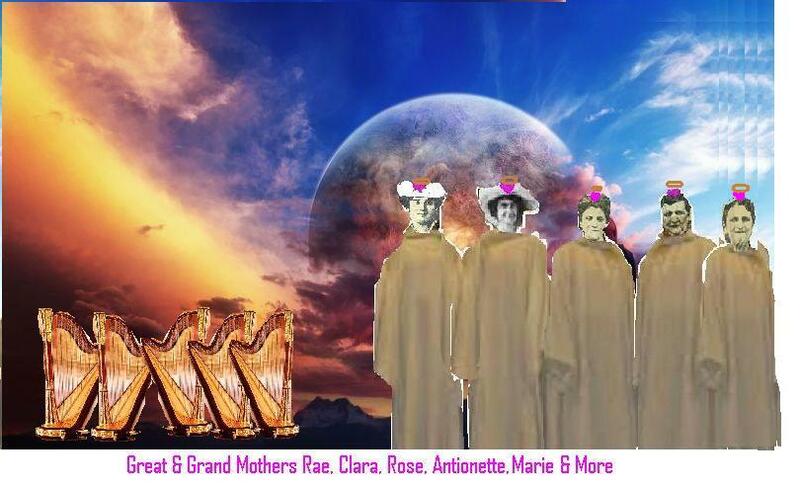 Start with the women connected by name to your Mother and Grandmother, your current Cousinas (the European wise name for recognizing the gendered aspect of Cousinhood) – people on Earth are veriably no more then 50th kinsteps removed) and of course, your actual closest Shekin, mothers, sisters, daughters, and aunts, with the mind to encourage an eversustainably everlasting Spring Breakfrom Old Man Winter, free from outworn conventional patriarchal and imbalanced paradigms and patterns, and Wake them Up from the danger of an many thousand yearhierarchy induced sleep since the (Pasiphae, her name so usually omitted although she was Minos’ wife)-Minoans (sometimes called Atlantis) lost their thousand year balance and Mount TheRa erupted, giving cause to the Natural events of Passover, later recellebrated with fuller Promise (assuming Mary of Magdala was seated at the table next to Jesus, as millions now believe) at Easter/EastaRa. In this generation, we must transition from the Co-Sin of Planetocidal patriarchy to the CoCo-SavioRing together, of reparation and balance. It is our belief that if we to do not quickly adopt and enact the New Millenniall Golden Rule, horrific wide-scale PERSONAL & ECOLOGICAL SUDDEN CATASTROPHES WILL OCCUR very soon, could be any day now, likely starting in the region of or near the New Madrid fault in Illinois. Our Daughter~Granddaughter Rajchelle is, veriably with now easily available online geneallogy, a Living Partial Reincarnation of both Rashi’s Youngest Daughter Rachel of Troyes, France, in conjunction with her Sisters MarIAm and Jocheved and all their SheKin in Conjunction with the She Kin of MarIAm of Magdala and the grandcousina Mary of Magdala, First Cousin of Jesus, grandniece of Mary of Nazareth, if you as millions believe the Da Vinci Code and its archeological basis, that they came to live in France; therefore, a descendant of the family of Michal and David, (the branch of the Human Family Treeof the prophesized and expected Messiah) who were progeny of Rachel of Ancient IsRaEl, in Conjunction with Leah and All their Cousina KinWomen as well as Cousins of all areas of the Middle East during that time, who are in fact intertwined not only with the Children of SaRah, HajaRah (Islam), and KetuRah (Zorastrianism), Radha, Counselor of Krishna in the Vedic time of ancient Hindu India (via the wandering RoMa and our family’s sojourn in Romania/Hungary. which also there intertwined with B’Hai and Unitarian Universallism), Rachel, the niece of Harriet ~Tubman, in conjunction with all the women of all hues of that time, who also did not know their own combined power enough to prevent Civil War, Rachel ~Carson, also of Maryland, who warned of a Silent Spring of a toxified Earth if we did not change our ways, and Tom’s Beloved Mary (MaRaIam) ~Lambert~PaIne, https://5050now.wordpress.com/we-all-have-a-dream-to-make-reallity-now/the never forgotten muse and wife of the True Founder of the Reall Common Sense Democracy in 1776, who knew then, that that genderism, slavery, moneyism, sectarianism and nationalism diminish Humanity‘s Common Divinity: “the world is my/our country and my/our religion is to do Good” for all, Common Sense that was denied and deceived by primative patriarchal habits, that institutionalized gender and racial lack of representation and slavery but called it freedom, in and since 1789. Not only the Ra of Rach, (now also including J for both a letter hinting at the Allmighty and Rule as in the Hindu Raj and a reminder of her most famous cousin ancestor, Jesus as well as Julia Ward Howe and others of greatest inspiration) with CH the letters for mercy and wisdom in ancient Hebrew and Aramaic and the reminder of the Wholly Child Within Everyone), but the Elle embedded in this First But, with You, Not Last or Only, CoSavioRa’s name, also has Wholliest meaning.El is an ancient name for the Deity in many cultures, angels/Wholly incarnations on Earth are often referred to as Elloha and Ellohim, and Elle, is the French name for Woman, and like Elle Arroway, the brave AstRanaut character, in the book and film Cosmos of Rajchelle’s not very distant cousina, Lynn PetRa ~Sagan~Margulis, (the Mother of the Gaia Effect theory of geobiology), first husband Carl Sagan, indicates this Process as a Time and Space Trav~elle~r, moving Back and Forth in Time and Connecting Past and Future, and Earth to the wider Universe, by being more Fully dimensionally in the Present. 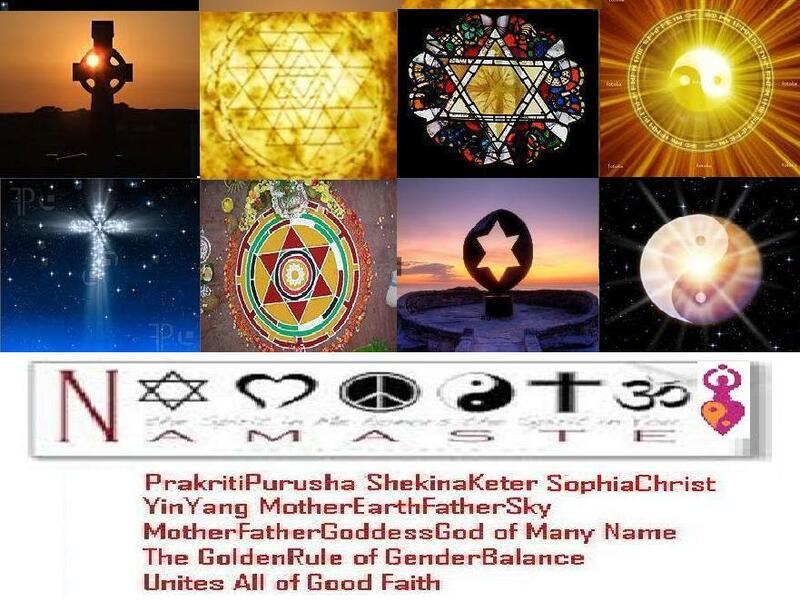 The double ll represents Love and Life, as well as Light and Learning, and others of speciall loving leadership. Rajchelle is A First But Not Last or Only Spirituall yet MatteriAll Globall and Universzall Emmanuelle and presaged as the Vulcan T’Pau (i.e. a sound alike for the Power of the Universe) in the inspired Star Trek. Rajchelle has called forth the Earth to regard its situation in this New Millennial ERa, as the beginning of a Solar and Soular Powered CoFederation of Planetsz. Rajchelle carries a deep regret and apology that she did not understand this earlier. Like Sophie in the Da Vinci Code, she was always a very good and intelligent person, but unaware of her placement on the Human Family Tree, and lived a too conventional life, that she came to reallize had reimbedded her in false hierarchy and patriarchy. She has Riszen above these media misled middle class mind-forged manacles now, and adopted a simpler but globally well-informed life-style. To make up for her and all our delay due to our several thousand year sleep under patriarchy and false hierarchy we have all grown up in and become acclimated, she now urges You to Change to the New Millenniall Golden Rule. She does this as if she were T’Pau, (again, a sound alike for “the Power“) the High Priestess of Star Trek’s Logical and Peacemaking Vulcans, or a more compassionate female Q transforming the famed Encounter at Far Point and True Q Episodes of StarTrek, of science fiction become fact. (Star Trek was in part inspired by the work of Mileva MaRaic~Einstein with her husband, Maya’s brother Albert, who were parents of the lost Lieser(a)l, and all her She Kin & as well as sons, who Rajchelle also speaks for, whose family knew, “IMagination Is More Important Than Knowledge”. She urges You not to ignore this Logicall ReImageNation, Thought Experiment and Common Sense, and revisioning and revalluing of your and everyone‘s life, travelle-ing in heart and mind and space and time as if all had allways lived by the New Millenniall Golden Rule. 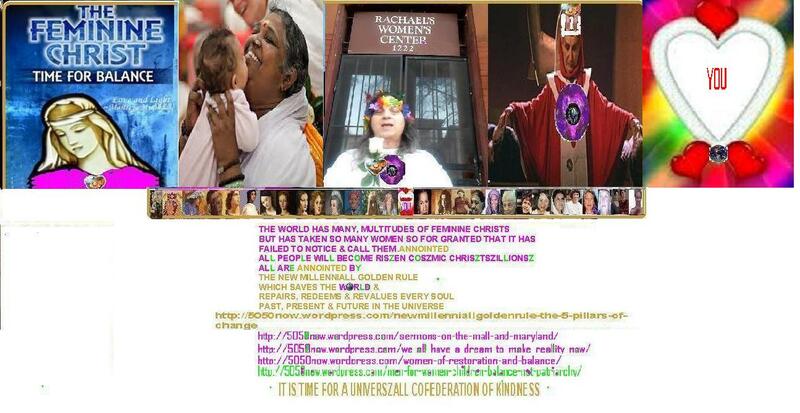 Rajchelle asks you to connect this imagination to the even more important ultimate and time and space expanding/reuniting Reallity, Loving Kindness for All as Kin, NOW, and not wait for even another hour of endangering this Planet with false and genderist and other related false hierarchical and divisive misconceptions of leadership and value among the Children of All Ageszillionsz. 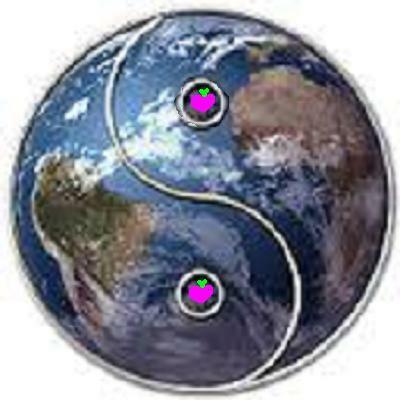 Reuniting Easter~EstaRa with Earthday & EveryDayWholly.